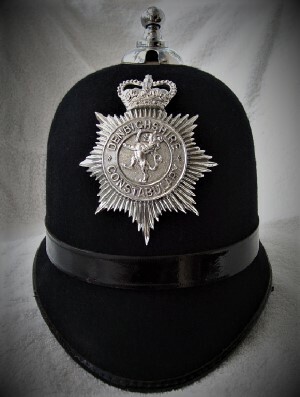 A 1960's uniform helmet of the former Denbighshire Constabulary. It was then amalgamated with Gwynedd Constabulary and Flintshire Constabulary to form a new Gwynedd Constabulary. In 1974, that force was renamed North Wales Police. In 1965, the Denbighshire force had an establishment of 320 and an actual strength of 302.